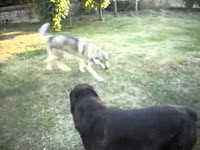 Rottweiler and wolf best freinds, interesting video about the wolf-dog friendship. These two canine friends have known each other since they were puppies and love playing together with each other. It’s nice to see them getting along so well, no matter how down you are,their unlikely union brings a smile to the face of everyone who sees them. Amazing video shows Rottweiler and wolf playing at the park.